John Mason, now 90, has been a thoughtful if self-effacing presence in the art world since the 1950s. He is known primarily for his large scale sculptures made not of metal or marble but of clay. 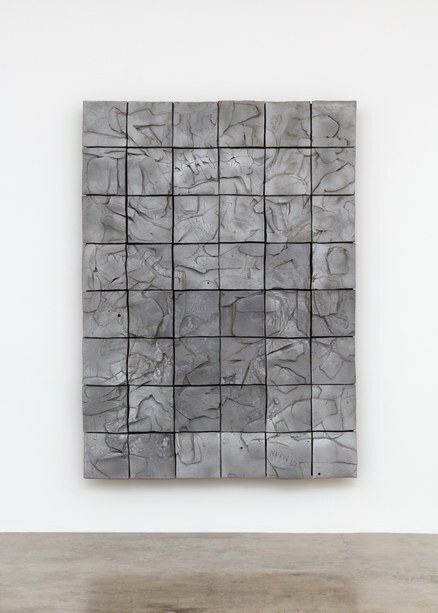 His work has been included in numerous exhibitions focused on the radical use of clay as practiced on the West Coast especially in the 1950s and 1960s. He shared a studio in Glendale with his fellow sculptor, the irrepressible Peter Voulkos. Together, they built an enormous kiln where they fired their clay sculptures that had more in common with Abstract Expressionism than with tea pots. 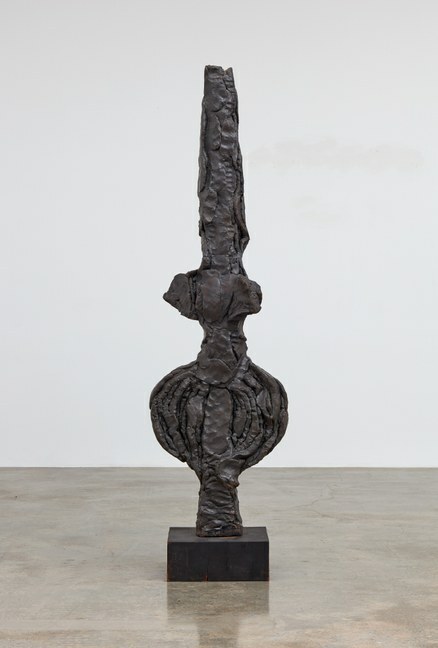 An exhibition at Kayne Griffin Corcoran Gallery in Hollywood, John Mason Sculpture: 1958-1964, is a focused opportunity to see Mason's work in a new context. 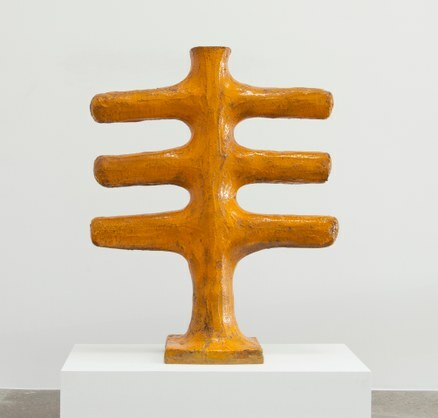 Organized by Frank Lloyd, an art dealer who represented Mason for many years, the show is curated with the intention of bringing attention to the formal shapes and masses of the work itself without the usual parameters of categorization. It is singularly impressive. In this spacious installation, these pieces breathe with a new autonomy and enhanced presence. The earliest, "Vase" (1958), is composed of chunks in primary colored glazes stacked atop one another. 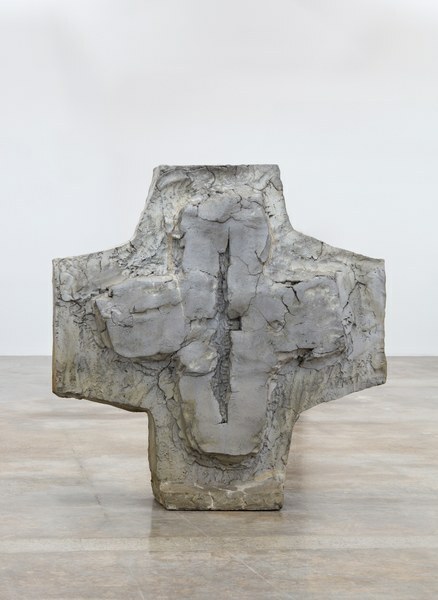 The stunning "White Cross" (1964) stands some five feet tall and wide, a stocky, gestural presence of cruciform-shaped creamy ceramic. 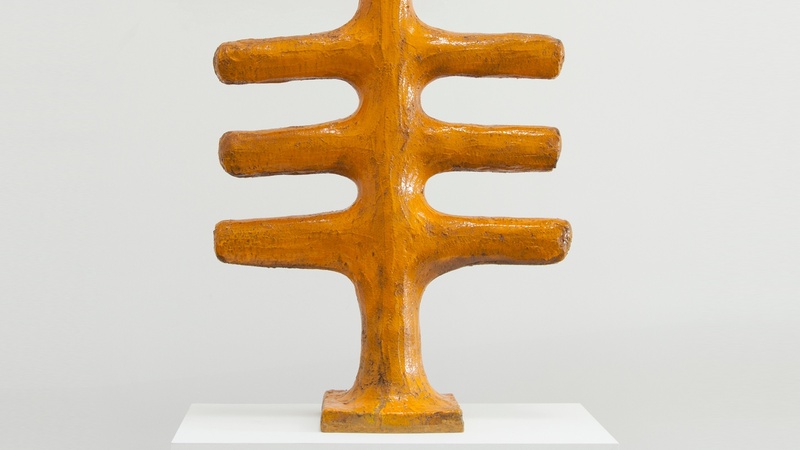 "Orange Cross" (1963) also stands about five feet tall but is a three-branched totem glazed in bitter orange. Even if you are familiar with Mason's ceramic sculptures, the tight presentation of just nine substantial pieces leaves you with the impression that his is an art of quiet depth and originality. It is on view through August 26. 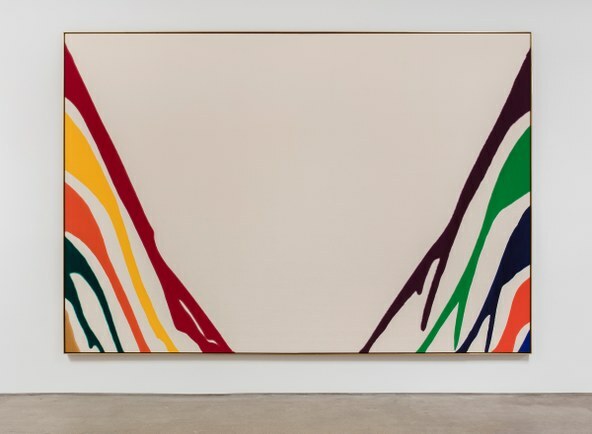 Another serious body of work from the mid-20th century is Morris Louis at Honor Fraser Gallery in Culver City. Morris Louis (1912-1962) was one of the foremost figures in Color Field painting, a technique of pouring thinned pigments directly onto large panels of raw canvas. In his best known works, termed "Unfurled," rivulets of unmodulated color were poured diagonally across opposite edges of the canvases as though framing the empty space at the center. They appeared both softly spontaneous and carefully controlled. They gained Louis considerable respect in 1961 but he was unable to produce much more work. He died of lung cancer at age 50 the following year. Louis's art is well-known so there is nothing unexpected in this show apart from the fact of the show itself. This is a rare opportunity to see a small survey of important paintings of exceptional quality and condition. It is on view through August 30.